Get a practical understanding of the CAGED system so you can start applying it in your own playing. Learn the six functional chords that operate within the context of a diatonic scale. Learn a really easy way to expand your pentatonic major and pentatonic minor into diatonic scales. Learn about an interesting concept that involves combining the minor pentatonic and major pentatonic scales. Pick up a few intervallic techniques you can use when composing solos. Learn how to improvise across the entire fretboard comfortably and confidently. Learn how to effectively incorporate melody into a solo. Some straightforward, essential practice techniques you can work into a simple, short daily routine to improve your dexterity, speed, strength and stamina. Shredding is fairly easy to learn but hard to master. Learn how to truly master it with these exercises. 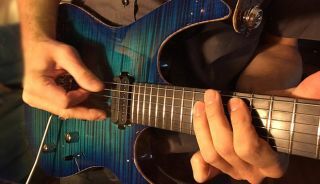 Become a more versatile player by learning how to combine the minor and major pentatonic scales. This kind of thing reminds me of a Johnny "Guitar" Watson move. It also helps get fingers accustomed to sliding very quickly.